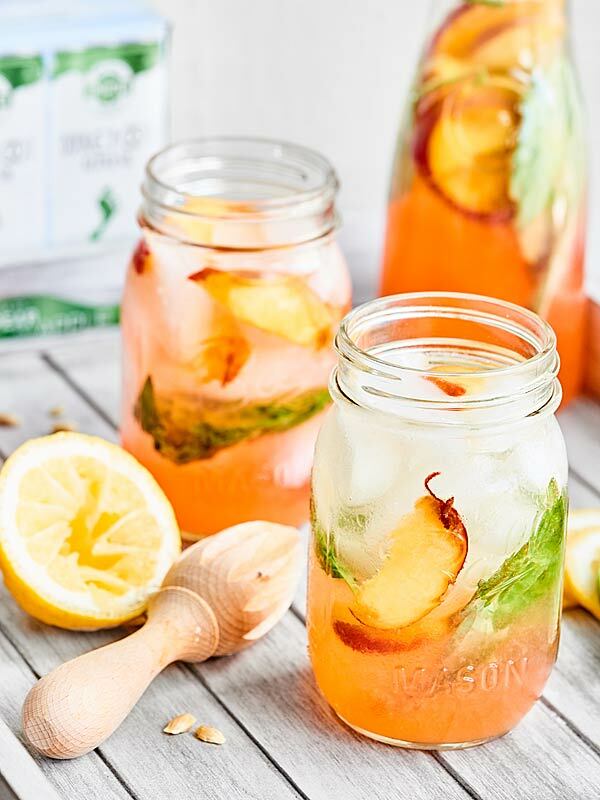 This light and refreshing cocktail combines the flesh flavours of ripe peaches and basil with the crisp taste of either sauvignon blanc or pinot grigio. The bit of sparkle added by the club soda makes for a delicious treat on a warm summer evening. Add quartered peaches, honey, basil leaves and water to blender and blend until smooth. Once blended, spoon mixture into an ice cube tray and place in the freezer until frozen solid. When ready to serve, pour the bottle of chilled wine and club soda into a large pitcher. Stir with a long-handled spoon to combine. Add peach ice cubes to wine glasses and top with the wine mixture. Add remaining flavoured ice cubes to the pitcher or reserve to add to the wine glasses when they are refilled. Garnish with fresh peach slices and basil before serving.